Some of you have known that for some time I've queried Wizards of the Coast for options to get some life back into the World of Mystara and the Princess Ark. Unfortunately, Wizards isn't interested in cooperating. This became clear when I began talking to their IP manager, who informed me that any arrangement regarding Mystara was out of the question at this time. There was no interest in anything involving a transfer of rights, a sale, a license agreement, a permission to publish, or any other option--as a matter of policy. From what I'd heard of WotC, I knew this going in. What I really was interested in was writing new stories specifically for the Princess Ark, originally published in Dragon Magazine some twenty years ago. For a time, it sounded like an arrangement might be possible. Since Mystara wasn't available, it still would have involved stripping all related D&D- and Mystara-specific details. It would have left the ship and her crew completely bare of any background. However, WotC's IP manager decided that even this constituted an IP, and therefore wasn't available. I offered cash, free ads, efforts to coordinate and support the release of D&D Next (etc. ), to no avail. That so many of you would be overjoyed to see any RPG release linked to Mystara or the Princess Ark didn't appear to be relevant in the least. Although this development may appear heart-breaking, there is a silver lining. As the discussion developed, I became convinced that any involvement with WotC was a waste of my time and a future liability. Writing Princess Ark stories without her original background seemed bad enough, but in the event of a licensing agreement or a simple permission to publish, I would have been obligated to regularly submit any development for approval. This would have made the experience infinitely worse, provided anyone at WotC were available for the approval process--which apparently isn't the case. I was given to understand that WotC doesn't want to spare staff for this sort of work, even if they had anyone knowledgeable enough to do these old IPs justice. This seems to be the situation for most of the old TSR game settings--not just Mystara or the Princess Ark. The end result would have been a creative straightjacket at best, or more likely a nightmare. Time has come for me to set sail across stranger skies. 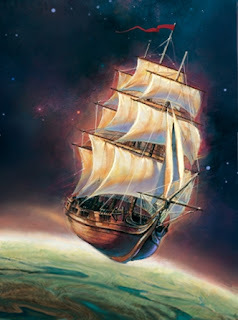 I think there's plenty of room out there for another ship, another crew, and new adventures unbound by darkness. Although stories would take place in another world, in spirit one might think this is the Princess Ark reborn. My plan is to move on with brand new fiction stories and release them as E-Books. Your interest and support will be key in making this dream come true. Once I get the details worked out, a Kickstarter campaign will become a must. You can show your support now by sharing this article, posting your comments, or hitting the + button. Thanks to all of you for your friendship and the manner in which you welcomed my return after a fifteen year hiatus. It was a heartwarming thing for me, and to no small degree, this fueled my devoting so much effort to this blog. Please understand I don't mean to stop contributing. I'm opening another door and looking at what could have been and at new opportunities. I hope you'll come explore some new frontiers with me. Until then, I say: "Onward, my courageous companions! Let us seek a better, bolder, grander future!" Not to be confused with the Capital City of Ar, this northern county lies within the Kingdom of Ambur’s borders. Hotheads have gotten into violent arguments about the name’s “intellectual property,” each side claiming moral ascendancy over the label. In truth, it’s neither here nor there, as both in their own ways do reach for the sky. The seat of the county lies in the provincial town of Star Fall (8,000 inhabitant plus 1,500 military). It earned its name from a small meteroid that once crashed in the vicinity. Wizards moved into the area shortly afterward, hunting for bits and pieces of the monolith. Local population grew thereafter, with peasants and workers seeking good fortune. In Ambur, wherever there are wizards, there is work and money to be earned. It turned out that fragments from the outer space bolide bore special properties that, when combined with the manufacture of optical lenses, lead to a new branch of stargazing technology. A local school was founded, accredited by the renowned Lady Alathazam, which promptly acquired the technique and offered it to its students. It became known as the School of Transposition. This small kingdom at the northeastern tip of the Alphatian Empire has been variously described as a quiet, underdeveloped, fog-shrouded realm engrossed in its passion for theaters and stargazing. There is far more to the story to explain the success of Ambur. This picturesque image, however, serves to veil a most peculiar and sinister secret. There was a time when this land and much of what is now mainland Alphatia belonged to ancient and primitive tribes of eastern Neathar folk, known as the Yan. They became strongest in the north after the Alphatian Landfall, two millennia ago. During the following centuries, when Air Wizards pushed from the south, Yani tribes were forced to cohabit with the Fey, mystical forestfolk who’d claimed vast boreal woodlands. Those of mixed Yan and Fey stock, known as the Yanifey, eventually supplanted the old Yan folk. With their ancestral hold upon the cold, misty woods increasingly challenged, pureblood Fey yearned for greater magic with which to keep the Alphatian invaders at bay. At the Fey’s bidding, the Ogam, a swarthy people hailing from unknown shores, responded to the call and, for a time, stalemated the Alphatian onslaught. But as the fight lingered, these dark mages engendered a mysterious calamity. It withered woods in the northwest, impoverished the soil, and invited a harsher climate. As a result of the magical mishap, the Fey vanished overnight and surviving Ogam retreated into the northern Kerothar Mountains, leaving the dumbfounded and distressed Yanifey to hold the plains. In the wake of the Twin Peaks Campaign, Ar annexed this stretch of land, but left borders open to merchants and bankers to help alleviate bad feelings among Amburian neighbors. Many among Amburian nobility and the military still consider what is now Ar’s Wraith District as rightfully theirs, having led their army to wrest this land from a rabble of ungrateful renegades. In view of their fiscal advantages, bankers and merchants have gradually forgotten the divisive issue and shared in the wealth from Ailpon. Once a fishing village, it grew as the result of the nearby cloudstone mine and became a boomtown, complete with a sprawling seedy quarter, daily tavern brawls among free miners and sailors, and restricted areas reserved for wealthy upstarts or the military. Amburian nobles now see these investors as greedy turncoats, adding fuel to their discontent. To make matters worse, a strange and intimidating race of people moved into the area and made the district a haven for their kind. They are the ones who gave the district its name, and the real reason why this piece of land was separated from Wyvern. Aran Wraithlings are people who’d fallen victims to incorporeal undead but were returned to life. As a result of the magic used, their minds and bodies bear the stigmata of their ordeal. Their flesh is somewhat translucent, showing bones, muscles, sinew, and organs as shadows. Their facial traits, however diaphanous, remain gaunt and disturbingly morbid. With clothes and makeup, Wraithlings appear as normal people but, to put it simply, the similarity is skin-deep. Since their arrival, Wraithlings reproduced and formed a prominent caste of aristocrats. Their request to establish this land as their own district was quickly approved in Skyreach for two reasons. It was a good way to entice Wraithlings to leave other districts of Ar where they were often unwelcome. Another reason was to exploit the Wraithlings’ presence on the eastern shores of Crystal Lake as a deterrent for Amburian pretensions—another singularly unpopular decision across the border. The intimidation is purely psychological, based on common prejudice and irrational fears, because Wraithlings are neither monsters nor a threat to society. Their looks and the idea of what they once were is what causes most people to loathe them. This region became a part of the Kingdom of Ar as the result of a conflict between Foresthome and Ambur. The stretch of land east of Crystal Lake was a marshy wilderness infested with stirges. It had become a hideout for runaway serfs and renegades of all sorts. They established an “underground” network to help others like themselves escape from the Kingdom of Ar through Ambur and then south into what was called the Twin Peaks Borderland. The Stargazers’ Realm feigned concern when Aran nobility complained, but in truth Amburians professed a deliberate indifference. Fugitive communities were doing well, settling the region and confining the stirge peril to the darkest woods. Amburian nobility and merchants eyed the Twin Peaks Borderland with mounting interest. Bowing to pressure, their king finally issued the Starpoint Edict, formally claiming these new lands. When they heard the news, settlers banded together and established a free and independent republic, sparking the Twin Peaks Campaign. What should have been an easy takeover for Ambur’s small but capable army turned sour when the republic’s beleaguered supporters offered their allegiance to Foresthome in exchange for protection. The Sylvan Realm agreed and sent troops. Although Foresthome wielded a much stronger force, it lacked the cohesion and focus needed to dislodge Amburian occupiers. The northerners’ commanding cadre of astrophysicists and engineers proved a match to their opponents’ wild and spirited élan. The three protagonists became mired in a costly, drawn-out conflict featuring countless sallies and counter-attacks. Meanwhile, serfs in Ar got wind of the brave little republic’s advent, and became increasingly restless. After putting down several small peasant revolts, the Kingdom of Ar decided to intervene. The recent discovery of cloudstones across the lake helped fuel the bellicose resolution. In the name of “peace,” a large fleet of skyships flew in unexpectedly from Ceafem, the old capital, and in great fanfare ostensibly took Ambur’s side. They spearheaded a speedy aerial offensive, dropped troops behind enemy lines, and quickly routed the sylvan rabble. Along the way, Aran forces repatriated or summarily executed whomever they pleased, with a particular predilection for captured leaders of the offending republic. Throngs of refugees and shattered remnants of the republic’s fledgling volunteer army fled south into sasquatch tribal lands, while skyships rained fire and destruction upon them. This unique doughnut-shaped floating island is the last district to have been created in the Kingdom of Ar. A royal edict abruptly carved out a large area of open space and prime fishing waters once shared between Hippogriff, Griffon, Skybridge, and Wyvern Districts. Sour feelings remained ever since the partition, because viceroys weren’t consulted about the decision or even told of its rationale. Instead, a haze of secrecy surrounded the event, letting on solely that the new dominion was off limits to all but a select few in the Aran military. The new District of Vortex has no viceroy but a shadowy military governor. From neighboring floating islands and ships skirting the forbidden area’s borders, one can observe two floating islands and, fairly frequently, an enormous whirlwind spinning through the main island. The turbulence stretches from the lake’s surface to 13,200’ (4.400m) through the monolith’s midsection before blending with thick clouds above. At various times day and night, lightning bolts randomly discharge from Vortex Prime’s outer rim, adding intermittent rumbles to the tornado’s distant roar. The sight alone is enough to keep most visitors out. On certain days, freak storms develop on Crystal Lake, showering the shores with hail, miscellaneous debris, frosted fish, and occasional monster bits. The roots of the mysterious event go back to a skyship commander, one Captain Aerwatt, who was concerned with the clear and present threat of a possible new ogrish invasion. He’d always shared with his friends and peers his concerns about the lack of adequate fortifications along Ar’s southern border and troops to hold them. Tired of his commanders’ apathy, he came up with a radical approach that was guaranteed to earn King Qissling’s interest, and his eventual approval. A top graduate in air magistry and aspiring grand wizard, Aerwatt’s basic idea spun from proverbial “mopping up” efforts to rid the land of foes and other undesirable features littering battlefields in one fell stroke—or in his case, in a gigantic whoosh. He devised the construction of a ring-shaped monolith fitted with magical devices accelerating air within its midsection, angled in such a way to create suction beneath. If properly focused, the resulting whirlwind could sweep a mile-wide stretch clear of any marching army and, quite certainly, damage beyond recovery any siege equipment. The prospect of building a controllable tornado was so appealing to the king that the project got underway overnight. Captain Aerwatt was made governor and head of the project. That’s about it for good news. . .
. . . for bad news abounds.